That’s right! One lucky Mychicbump reader will win an item of their choice from Karen’s fabulous Maternity closet!! You could win the Red Jeggings from the post that started it all, Simply Chic. Or the Silky blouse recently worn on our TV appearance, or perhaps our most versatile piece, Seraphine Maternity’s nursing cover. ** And the WINNER of the giveaway is …. Thank you to all who entered! Keep following MyChicBump for more fabulous giveaways and styling tips! I am obsessed with that Seraphine nursing cover but if I had to choose one look to win it would be the white lace dress! I have been searching for weeks for the perfect lace dress for my sunset matrnity shoot in May with no luck :(. My bump is 25 weeks along! Hi Kelly! Actually it’s a two-piece outfit meant to look like a dress. Find post underl ‘Knits & Lace’ For this look, we are giving away the cream knitted maternity top with rushing on the sides. If you’d like to change your vote for the nursing cover instead, let me know 🙂 PS: There are gorgeous lace maternity dresses over at Asos Maternity right now that you’ll find on sale. Who knows? Maybe you’ll find what you’re looking for! 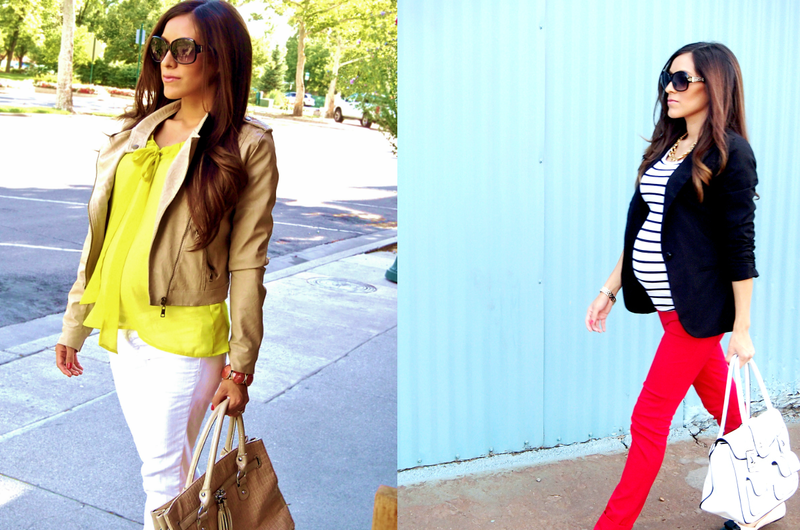 Currently my sweet baby bump is 4 months:) All the outfits are fabulous, if I had to choose.. it would have to be red pants with black blazer and striped shirt!! LOVE IT! That’s ok…my vote is for the red jeggings:) Thanks!! I’d love the asymmetrical black & white striped dress. I’m 26 weeks tomorrow! The red leggings are gorgeous 🙂 my bump is 25 weeks today! I love the red jeggings too! Such a cute outfit! I pinned and instagramed this post. I’m 25 weeks along with a sweet baby boy. Love your style!!!! Red Leggings!!! I’m 26 weeks along now. I’ve followed your blog and got myself the blazer and the pinstripe shirt from H&M Maternity but haven’t been able to find the red pants/leggings!! I’m obsessed with the look. Keeping fingers crossed that I win these!!! I’ve tweeted, pinned to pinterest, instagramed, facebooked and now commenting! They are all so gorgeous, it’d be hard to choose. My absolute favorite is the Cream Knit Sweater, but since we’re having an August baby, I’m not sure if it would be weather appropriate?…so if not I’d probably go with the yellow blouse…but then again…those red leggings are STUNNING! I am 20 weeks (21 weeks on Saturday! )…halfway there! Pinned, instagrammed, and tweeted…thanks for the chance! Hey how are you if I had to pick it would be the lace dress. I would love the red jeggings! I’m 23 weeks! I am so happy to have come across your website. I am 25 years old and my bump is 4 1/2 months old! 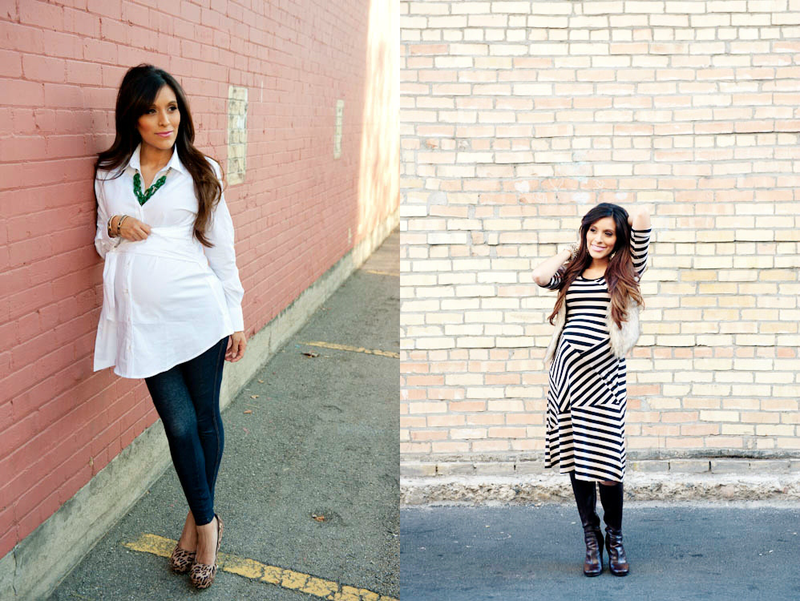 I have been having a hard time finding maternity clothes that I like because I don’t want to compromise my style. If I had to choose I would say the fabulous nursing cover! So versatile and chic! I just missed it 😦 my bump is 6months now and I really would’ve love to have the striped dress or cashmere cardigan. Although the contest is over and I’m just a tad bit late .. I’m very happy to have found this blog and I will continue to follow 😉 best blog EVER!